A minister, single and childless in his young adulthood, traveled to visit his relations during the holidays. He usually enjoyed bringing his faith to the occasions. One year, he was obligated to visit his older sister, who had converted to Buddhism. 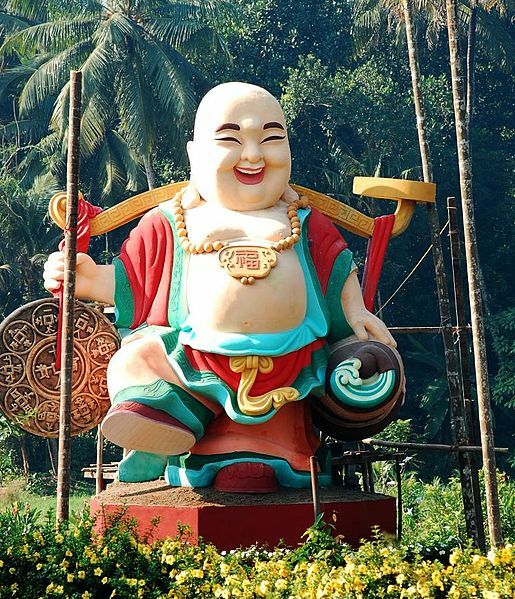 Upon arriving at her house, he noticed the figure of a fat, Buddhist monk at the top of his sister's Christmas tree. The monk was dressed in a red robe. He carried a sack that seemed to overflow with presents. "That's not Santa Claus," he remarked as he took off his coat. "No, it's Budai," said his sister. She greeted her brother and hung his coat. Then she offered him a plate of treats. "He embodies the spirit of the season." "The spirit of the season is joy at celebrating the holy gift of a son. That is, the holy birth and the holy presents given to a special child. What has the spirit of Budai got to do with that?" His sister offered him a candy cane from the plate. He waved it away. "Budai gives gifts," she explained. "Sometimes they are ordinary things like toys for children or sweets or medicines. Sometimes the gifts are special. They can even be living things, like children." She picked up a tray of cookies and offered him one. He shook his head. "You can't make a gift of an actual, living child," he said. He scowled at Budai and his sack. "Oh." She set down the plate of cookies. "I thought you would feel differently."